Vectorworks Architect software delivers an exciting suite of capabilities that takes you from sketch to BIM. 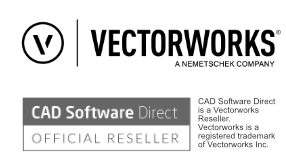 Vectorworks Architect 2019 is a comprehensive design and modelling software suite for architects, designers and engineers working in the built-environment. Time-saving architectural functionality is available from the outset - wall tools, door & window tools, stair tools, parametric modelling, IFC classification and much more help architects maximise their output in much less time than basic 2D and 3D software. With Vectorworks Architect software, you can create building information models without giving up the design freedom you need. Work with collaborators in the same file. Design in 2D or 3D. Tackle complex ideas with great documentation and graphical scripting tools. Enjoy integrated BIM capabilities that streamline costs, analyse materials, and increase energy efficiency. Enjoy the robust and flexible capabilities of BIM with the ease of design, great documentation, and intelligent tools that the software is known for. Building Information Modeling (BIM) brings together design, analysis, collaboration, and documentation for the benefit of all parties involved in a building project. As BIM continues to gain increasing importance in the AEC industry, software must continually evolve in order to provide design professionals with the tools they need to successfully implement BIM in their projects. Whether you’re looking to streamline costs, analyze materials, increase your energy efficiency, or just create world-class designs, you can create building information models without changing your preferred design process. Design smarter than ever with seamless project sharing capabilities, access to reliable cloud- based storage solutions, improved communication and visualization tools. Whether you’re a sole practitioner collaborating with other professionals or a large firm dividing work among different members of the team, Vectorworks provides a flexible way to manage productive BIM workflows for even the most complicated project. Make your work even more compelling and easier to communicate with digital imagery. Import or export a wide array of image files. Publish your designs for inclusion in your firm’s marketing materials or website. Get on the cutting edge of collaborative digital practices, exchanging 2D drawings, 3D models, Building and Site Information Modeling (BIM/SIM) data for numerous multidisciplinary, multi-platform design workflows, as well as sending models to CAD/CAM machines, CNC routers, and other 3D printers. Define your signature look and meet industry standards with Vectorworks Architect's precision drafting tools, intelligent objects for building, detailing, MEP, furniture, millwork, machine parts, and annotations, plus thousands of free symbols from leading building product companies. Batch print drawing sets or export them as multipage PDFs at full or reduced size. From graphical scripting tools and subdivivision surface modeling to point cloud support, you can create any shape and easily explore geometry. With it's intuitive interface, you can design from any 3D view using modes in modelling tools that automatically infer working planes as you move your cursor, and enjoy the superior quality that allows you to manipulate your model with ease. Transform rigid lines and primitive shapes into smooth, malleable surfaces to create sculpted objects, unique furniture, and more with subdivision modeling. This technique, based on Pixar Animation Studios’ OpenSubdiv library, allows you to design beyond the limits of traditional CAD software by subdividing and molding each surface into any form imaginable using the Edit Subdivision tool. With our intuitive interface, you can design from any 3D view using modes in modeling tools that automatically infer working planes as you move your cursor, and enjoy the superior quality that enables you to manipulate your model with ease. More accurate object information and better snapping make drawing in 3D easy. The SmartCursorTM helps by showing hints, like the angle from the previous segment, as you draw, and our patent- pending X-ray Select technology lets you see through models to select, move, and modify hidden objects with precision and ease. Plus, an advanced suite of solids and NURBS surface tools lets you create any shape and easily explore organic geometry. Push, pull, blend, twist, sculpt, deform, bulge, taper, or punch holes. Anything is possible with Vectorworks Architect. Field surveys and other manual methods used to capture existing spaces can now be replaced with Point Cloud Support. Using your preferred 3D scanning device, you can capture any physical location and import a 3D point cloud object to Vectorworks Architect using PTS, E57, LAS, and XYZ file formats. Capture a perfect, full-color representation of any location then import, snap to, measure, manipulate, and design within or around the extents of the scan. Architect's Energos feature empowers you to make sustainability a priority throughout the design process. Based on the Passivhaus calculation method, the Energos module gives you and your clients a dynamic, intelligent gauge of a building’s energy performance. Using convenient, color-coded graphics, you can measure a project’s energy efficiency, giving you the ability to make critical decisions about sustainability as your design evolves — all from within your Vectorworks Architect file.